The Hollywood Foreign Press hosted an intimate blogger luncheon at the Beverly Hilton with Sosie Bacon, Miss Golden Globe 2014 and daughter of Kyra Sedgwick and Kevin Bacon! I was lucky to attend this fabulous event and snag an interview with Sosie. The poised 21 year-old is pursing acting full time now and mentioned that she left school to focus on her career. "If you are serious about acting, you have to be all in or all out, and can't be in the middle." She is currently working on a short film and another R movie. 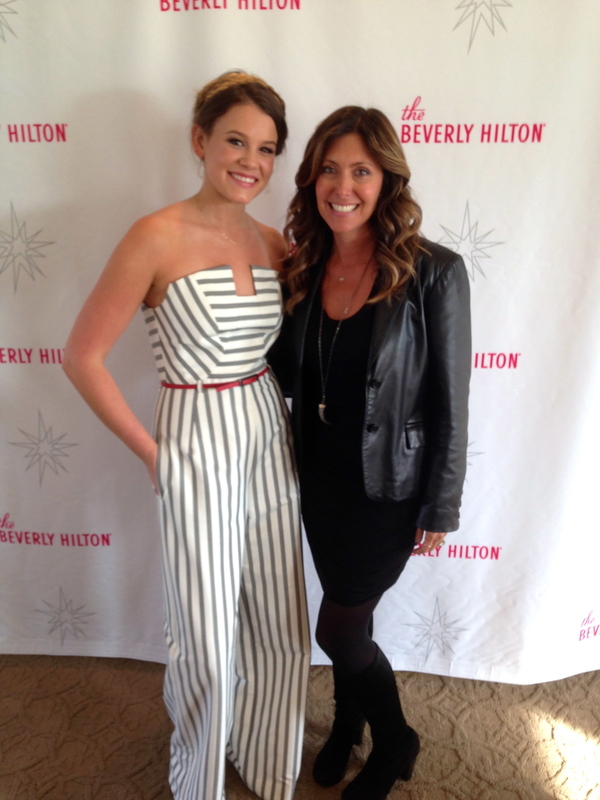 With Sosie Bacon at the Beverly Hilton, home of the Golden Globes! Sosie was wearing a high-waisted striped jumpsuit by Black Halo. I also love it in black shown below. Make-up artist Gabby Pascua did Sosie's hair and make-up for the event! Sosie's dainty necklace was a purchase she made at XIV Karats in Beverly Hills. "This necklace was $150 at XIV karats. The prices are right and the people are so sweet there." Necklace is 14 karat gold with small diamond circle, $150 at XIV Karats, Beverly Hills. I love Sosie's cherry lip color. Her mom, Kyra Sedgwick gave this one by Korres to her! 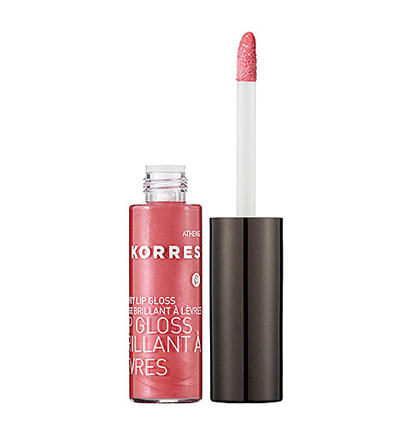 Korres Cherry Lipgloss, $17. Color is 16 Pink. Below are two fishtail braids are wrapped around Sosie's head and secured with bobby pins. Her ombre hair looks so pretty in this style. Cool 14 karat rings are all by Woodrow Jewelers. These were custom made for Sosie. The actual Golden Globe award is heavy and weighs about 8.5 pounds. Lunch was so elegant and well executed!